Is Sen. Mitch McConnell getting off the sidelines? Publicly, the Senate majority leader appeared much more involved Tuesday than he has the last few weeks in trying to move legislation to reopen the closed government agencies. Although he started the day blocking a move to reopen the closed agencies by way of unanimous consent, he went on to work with Democratic Senate leaders to reach a deal to bring two legislative packages to the floor. The first: The White House’s so-called compromise that includes funding for a border wall and temporary relief for some 700,000 so-called "Dreamers," as well as some very restrictive new language around asylum status. The plan was quickly rejected by Democrats. The second: Legislation that has passed the House to reopen the government at previously agreed levels, but only fund the Department of Homeland Security temporarily so that proposed debates over border security funding could take place. Republicans have said it’s a non-starter, because it doesn’t contain "Mexico City language" that restricts U.S. government funding from being used in abortion counseling and services by overseas organizations that receive that money. Neither bill is expected to pass. One Democratic aide said these were “show votes,” but the Senate voting at all seems like progress when there has been so little. While the new Democratically controlled House and Speaker Nancy Pelosi are now the most prominent roadblocks to most of President Donald Trump’s agenda, it’s been a host of Democratic mayors who have been the figureheads in some of the most contentious battles of the last two years. Mayors from more than 400 cities around the country have signed on to coalitions to combat the effects of climate change, despite the Trump administration’s to pull out of the Paris Climate Accord. 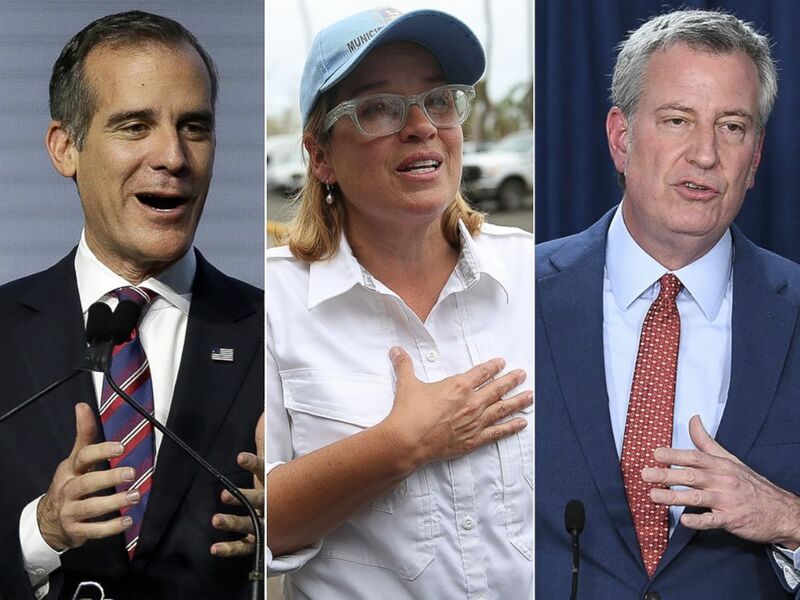 (AP | Getty Images) Los Angeles Mayor Eric Garcetti, left, San Juan Mayor Carmen Yuli­n Cruz and New York Mayor Bill de Blasio. A number of mayors, including Los Angeles’ Eric Garcetti and New York’s Bill de Blasio, have pushed back forcefully against parts of the administration’s immigration policy. Carmen Yulín Cruz, the mayor of San Juan, Puerto Rico, was thrust into the national spotlight over Trump’s response to Hurricane Maria -- and the public feud that ensued -- after the storm ravaged her city and the island. Several of these figures, some of whom are moving toward challenging Trump in 2020, arrive in Washington on Wednesday -- day 33 of the longest government shutdown in U.S. history -- for the annual U.S. Conference of Mayors. The event, which will be addressed by Pelosi and former Vice President Joe Biden, is a chance for mayors across the country to highlight the important work local government does on a daily basis. It might also serve as a powerful springboard for those who have their sights set on an even higher office, located a few blocks away on Pennsylvania Avenue. The House Oversight Committee is set to add a few more progressives to its roster. Several progressives, including Reps. Alexandra Ocasio-Cortez, D-N.Y., Rashida Tlaib, D-Mich., Rep. Ayanna Pressley, D-Mass., and Ro Khanna, D-Calif., are expected to join the high profile committee. The panel is already stacked with conservative members of the House Freedom Caucus, Trump allies who now could be facing off against some of the most progressive members of Congress -- at hearings featuring the president's former personal attorney Michael Cohen, Commerce Secretary Wilbur Ross, and other Trump associates and administration figures. South Bend, Indiana Mayor Pete Buttigieg launched a presidential exploratory committee Wednesday morning in a video posted to his social media accounts. U.S. Conference of Mayors 87th Winter Meeting opens for a three-day conference at 10 a.m. in Washington. House Speaker Nancy Pelosi addresses the nation’s mayors at 2 p.m.
Sen. Elizabeth Warren, D-Mass., hosts Columbia Organizing Event at 7 p.m. at Columbia College in South Carolina.